FULLERTON, CA (September 24, 2018) - Nicolas Junior High School and Fullerton School District, along with industry partners Advanced Technologies Consultants, Inc., and Festo Didactic, a global employer and partner in technical and industrial education and training; are proud to announce the opening of a new high-tech STEM lab at Nicolas Junior High School. To mark the occasion, NJHS, FSD, ATC and Festo will host a ribbon cutting ceremony from 9:00-10:00 am on Monday, September 24 at the school. The ribbon cutting will be assisted by: NJHS students, Dr. Robert Pletka, Superintendent of the Fullerton School District, Robyn Clemente, Principal of NJHS, district administrators, board members, Fullerton Chamber of Commerce. Fullerton School District is committed to engaging students in a rigorous STEM curriculum for school-to-career preparedness and challenges students to engage with authentic learning experiences that promote hands-on, minds-on approaches to becoming problem-solvers. Through experiential learning activities such as application development, robotics competitions, speech and debate, students develop capacity for collaboration, communication and leadership. Students can access enrichment opportunities by taking AP courses, summer makerspace programs and earn college credit in an after school middle college program. STEM education at Fullerton is as diverse and vibrant as the student population. Fullerton School District is located in northern Orange County, California and serves over 13,000 students in grades TK – 8th. The Fullerton School District includes 20 schools, 15 elementary schools, two K-8th grade schools, and two middle schools. The mission of the Fullerton School District is to work collaboratively with the community to provide an innovative, high-quality educational program for all students in a safe learning environment. The District motto, “Great Schools - Successful Kids” exemplifies the belief that all students will achieve academic excellence, acquire interpersonal skills, and develop technological expertise to contribute as productive citizens in a democratic society. For more information, please call (714) 447-7400 or visit Fullerton School District page. Nicolas Junior High School is the home of future innovators and mindful citizens who are determined, capable, and focused. We strive to be kind, productive, and generous. The students of Nicolas Junior High School are future innovators, who through personal determination and focus, will pursue a path of lifelong learning and cultivate their community. For more information visit Nicolas Junior High School page. ABOUT FESTO DIDACTIC: Festo Didactic is a leading provider of technical education equipment and training. 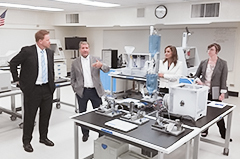 Festo’s educational solutions evolved from its world-class automation and engineering division and integrates the latest trends in each learning system it offers. The innovative product range from Festo allows educators and trainers to equip their classroom with the technology they need, from individual workstations to complete Learning Factories, as well as training and consulting, eLearning, courseware solutions, and LMS integration. For more information visit Festo Didactic page. ABOUT ADVANCED TECHNOLOGIES CONSULTANTS, INC.
Advanced Technologies Consultants (ATC) is the nation’s leading distributor of name-brand technical training curriculum, equipment, software and furniture. Since 1964, ATC has partnered with more than 2,200 school districts, vocational technical schools, community colleges and universities providing quality products and support services for career-ready students. For more information visit ATC page.